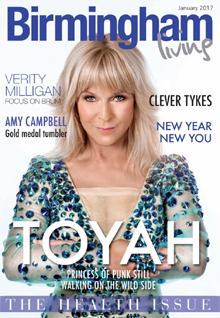 There is something very endearing about Toyah Willcox. She is one in a long tradition of creative, sometimes downright cussed, free spirits who mellow into a kind of national treasure with the passing years. Say what you like about Toyah, you could never pigeon-hole her. The original wild-child punk princess is credited with starting the Goth movement, has voiced the Teletubbies, champions the National Trust and survived the Celebrity Jungle. And this multi-talented ball of energy has now been officially honoured by her home city with a star on Birmingham’s Walk of Stars. Being Toyah, she challenges the word mellow. “I don’t think I’m mellowing,” she says, “though I do find things that freaked me out in the past don’t bother me anymore. And I’m working harder than ever.” No kidding! This is a one-woman phenomenon with a record company, six movies on the go and a touring band. A typical day starts at 6am, involves driving across the country, gigging, presenting and writing before final getting into bed at 4. Not that she’d change a thing. • Continue reading at Birmingham Living.